After two decades of hands-on experience with performance management systems in some of the world's most well recognized organizations, Markle has come to propound what he calls a universal law of modern business. People hate performance reviews. Drawing upon his studies of and experience with systems theory and illustrating his points with real-life examples, Markle explains why employees and managers both have come to regard the ubiquitous performance evaluation as industry's poorest performing, most ineffective, and least efficient personnel practice. By digging down to its roots, he helps us understand why attempts to correct the flawed system fail. He provides an innovative way to measure their ineffectiveness and inefficiency and then introduces his catalytic coaching to replace them. Markle shows how his system is superior to others in five key business outcomes: 1) positive behavioral change; 2) motivation to work hard; 3) retention of key contributors; 4) internal promotions and succession; and 5) prevention of and protection from lawsuits. 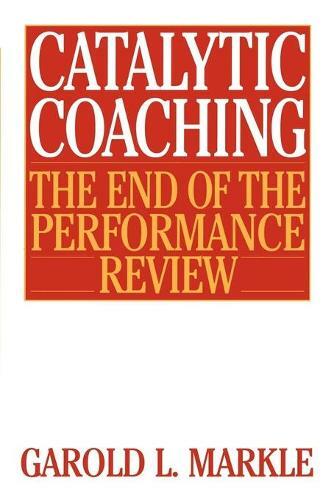 Not only is catalytic coaching more effective, it is also more efficient: it requires far less time and paperwork to implement and maintain. Markle gives his readers all of the forms, instruments and detailed instructions they need to operationalize his system. Business executives, senior HR professionals, and organization development specialists will benefit particularly from his presentation, as will other managers, executives, and supervisors, all of whom must learn to take ownership of their responsibilities to their organizations and themselves.